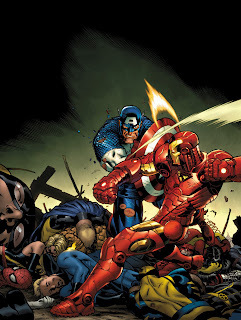 Civil War is my favorite comic arc in the history of ever and it had better be yours too. If you aren’t hip to the kids’ stuff these days, Civil War doesn’t actually refer to the War Between the States, or any other kind of historical event wherein a nation split amongst factions. Instead, it deals with a different kind of civil war: one among superheroes. We dealt with this same idea last week in Kingdom Come, where the superhero populace of the DC Universe had become so corrupt with power that it threatened to end the world. Well, this time we’re coming at it from Marvel’s side, and the story is unsurprisingly different. It’s always been a thing with DC and Marvel. DC writes stories where the characters are virtually gods – a rewritten mythology for the modern age. Their characters have relatively few weaknesses, and the villains are larger-than-life unkillable terrors. Marvel, on the other hand, likes its heroes a little weaker and a little more mortal. Its villains too. The stories Marvel tells can still be epic, but usually on a smaller scale (galactic rather than cosmic), and the character arcs tend to hold more water. 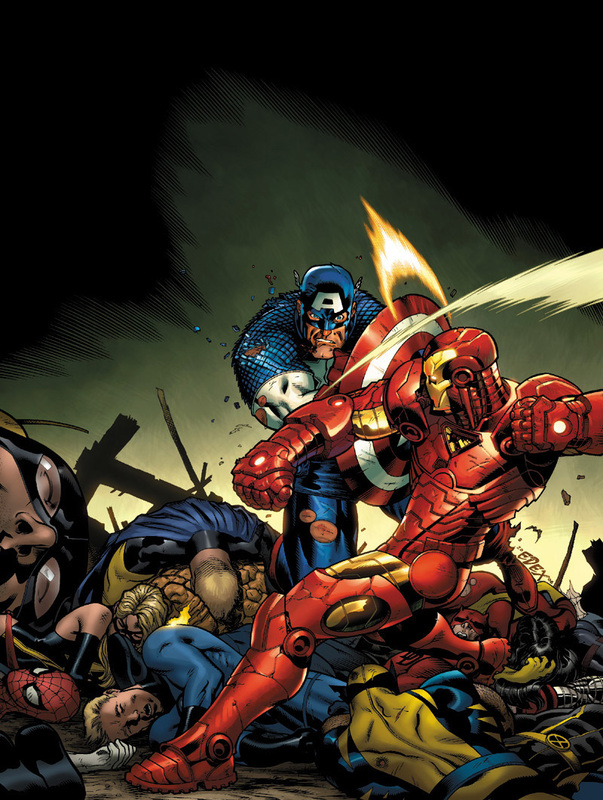 The actual Civil War comic is comprised of a series of crossover comics from 2006-2007, written by Mark Millar, art by Steve McNiven. 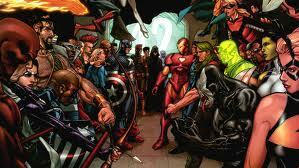 The series crossed through nearly every major Marvel franchise, and kind of seriously ruled. Its tagline was “Whose side are you on?” and it followed the whole superhero community when it faced the ultimate question: should superheroes have to give up their secret identities? That may not immediately sound like the be-all end-all thought for superhero-kind, but it really is. It gets at the heart of what it means to run around wearing tights, whether the mask is actually important, and who is responsible for these guys anyway. But the real reason this series rules? Because the answers are not easy, and they are not comfortable. And because people you love are on both sides of the line. The story follows the implementation of a governmental bill requiring the registration of all superhumans. The bill, brought about because of an extremist response to meta-human destruction and death, requires that all heroes publicly register their identities. Tony Stark, Iron Man, is for it. Steve Rogers, Captain America, is against it. That right there is the crux of the whole story. If you’ve only really been exposed to those characters through the Marvel Movie Universe (Avengers, basically), then I need to explain to you a thing. 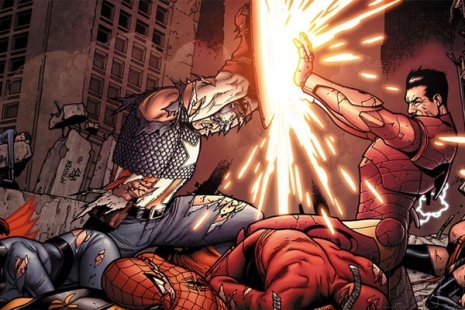 Cap and Iron Man are bros. Best friends. Incredibly close. Best men at each others’ weddings close. So when we find out that these two guys are split ideologically, and that these are the lines they’re split on, it’s devastating. Moreover, it’s surprising. Tony Stark is fronting for the government and supporting more Congressional oversight? That seems weird. And Steve Rogers fighting against his government and openly defying it? I feel dirty inside. But that’s all part and parcel of what makes this a great story. The human element. A huge part of that is Peter Parker. 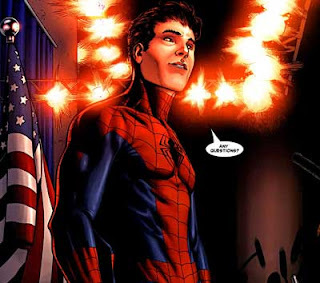 Now, as you all know, Peter Parker is Spiderman, but he really doesn’t want anyone to find that out. In the comics, and in the movies, this is because Peter actually has a life, and people who love him. He’s married to MaryJane. He’s still close with Aunt May. His decision to protect his identity is not a casual one, especially since he tends to deal more with street thugs that would have no compunction about roughing up his wife. Peter gives up his identity under pressure from Tony and the government. Then he realizes that he’s made a huge mistake, upon seeing the giant prison that Iron Man and Mr. Fantastic make to hold all the superhumans who won’t agree to registration. He decamps to the other side. The arc actually ends with him huddling back into hiding, and trying to make a life for himself again. 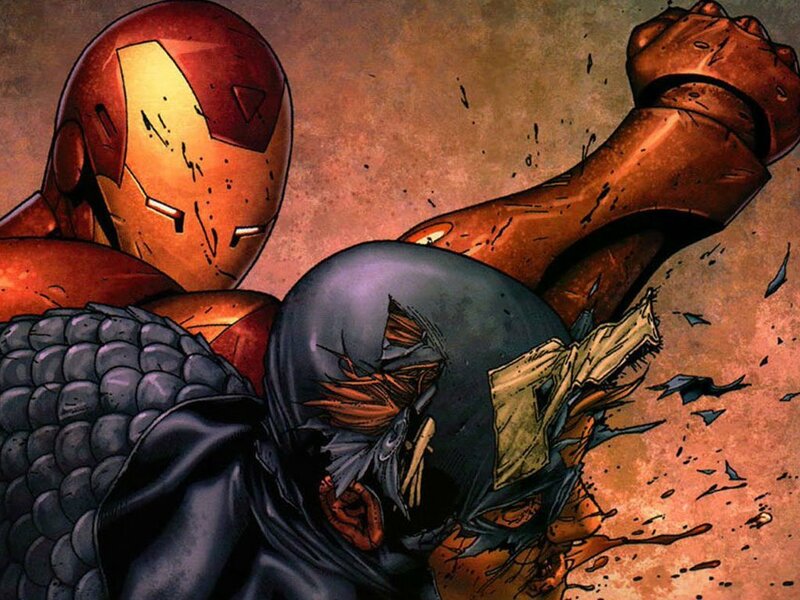 Oh, and with him hating Tony Stark’s guts. Why do I mention all of this? Well, because I think Peter’s story, and the flip-flopping he does, sum up really well how we all feel about this issue. And by issue, I don’t mean whether or not superheroes should get to keep their secret identities. I mean the conflict between security and freedom. We think about it a lot, even if we don’t really think about how we’re thinking about it. In America, the gun control debate rages on because we’re really not sure where we stand on this. We created secret prisons on the other side of the world to keep us safe from terrorists who now want to kill us even more. We passed laws that say we can spy on our own. We live in a screwed up world and the only thing we can’t figure out is what will be better: more security, or more freedom? This is where Peter comes in. At the beginning, he thinks the choice, while not easy, is clear: more security. When he gives up his name to the government, he’s implying that he will trust them to use that information wisely, and to protect him should he need it. But when he finds that he government may not be entirely trustworthy, he takes it back. He changes his mind. He chooses freedom. I have to admit that I really don’t know which one I’d choose, if I had to. It’s easy and fun to think that we would immediately pick freedom, and certainly that’s the more colorful option. Unfortunately, I know how craven and cowardly I can be when I’m not being my best self, and I also know the pleasant comfort of security. And who are we to say that security is a bad thing, anyways? Why is it so easy to dislike, from a distance, that is? If I had to take a stab at it, I would say it’s because at our core, we want to be free. Free from what, we usually don’t know, but we want to be free of something. That’s what fuels most mid-life crises, burnouts, and hippies travelling the globe. We want to be free. When I described the plot up there, it was easy to tell that Captain America was the good guy, right? 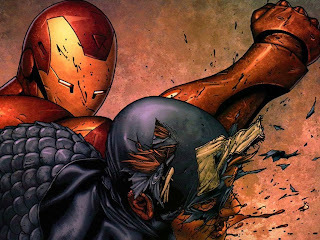 Even though you knew that there was a gross amount of legitimate devastation that Iron Man was trying to prevent. Even though they both really had reasonable points. And even though Cap was the one to make the first violent gesture? 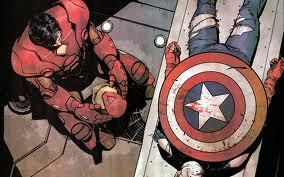 It’s not all that weird when you think about it, that Iron Man chose security and Captain America chose freedom. Tony was a man who built himself a giant suit of armor to save his own life. He knows security very well. But Steve was the guy who volunteered for a war he was unfit to serve in, and took a leap into potentially deadly science, because he believed it was the right thing to do. So, not surprising at all really, in the end. But Cap is still definitely the good guy to us, isn’t he? Here’s the other thing: security is easier, but freedom is better. Better, I would argue, because it requires of us the one thing that security refuses is. Freedom requires that we trust each other, and that is both noble and nearly impossible. In the end, history vindicates security, and stomps on trust. Tony Stark becomes head of SHIELD. Heroes flee for Canada, and the bill gets passed. Sure, it’s not as draconian as it could have been, but still. Still. What’s the point I’m trying to make with all of this? Well, aside from my usual point, that I would very much like it if Marvel/Disney were to make Avengers 3 or something based on the Civil War arc, I also want to make a larger point about trust and freedom. We’re at a point as a society where we don’t trust anyone. Not each other, not our government, not our collective humanity. We have an incredibly low view of ourselves and each other. But we still want to be free. And I’m here to tell you that we can’t be free until we act like we are. It sounds weird but it’s true. In order to be free, you have to act like you are before you feel it. Because the act of trusting each other and going about our daily lives again is what will make us free. And also I would like to make a smaller point, that I love this arc. The Watch Furious 7 is upcoming movie of paul walker.This movie goes the last time appearance of paul walker.